Hand-painted with lovingly detailed modelling. Dr Strange, a powerful magician and member of the New Avengers, faces a challenge from the supervillain Dormammu. A battle that will decide the fate of the earth. He comes in a Marvel themed box. This beautifully hand painted Shleich Dr. Strange is depicted in an action pose, featuring a spell book and swirling purple sculpted smoke to create the illusion of his renowned magical abilities. He's also accompanied by the infamous red cape, and is painted in the bright colour's typical of Dr Strange in both the Marvel Comics and Marvel Cinematic Universe. 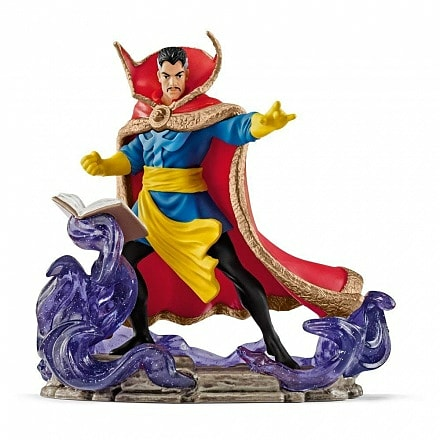 Shop the Dr Strange Statue today, at GAME.